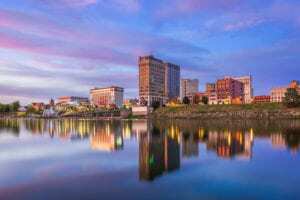 Stewart Bell’s main office is located in the heart of Charleston, West Virginia’s capital and most populous city located at the meeting of the Elk and Kanawha Rivers. Our experienced nursing home abuse and personal injury attorneys are devoted to serving the Charleston community and protecting its people’s interests by helping elder abuse and injury victims receive the compensation they deserve. Our managing partner, Jeff Stewart, was born and raised in Charleston. He has dedicated his career to assisting people in his hometown in their greatest times of need. Together with his competent and passionate team, Jeff pursues cases of nursing home abuse and personal injury. Stewart Bell, PLLC, Charleston’s injury and nursing home abuse lawyers, are committed to your satisfaction, and make it their goal to obtain maximum compensation for their clients. If you suspect an elderly loved one is a victim of nursing home abuse, don’t hesitate to call our Charleston office to speak with an experienced and dedicated nursing home abuse lawyer. At Stewart Bell, PLLC, we aggressively protect the rights of elderly Charleston citizens who have been abused by an unethical nursing home. Your loved one’s quality of life is deeply important to us. That’s why we will do everything in our power to fight for abused elderly residents and their families to receive the compensation they rightfully deserve. Having filed over fifty nursing home abuse lawsuits, we have recovered millions in compensation for our clients. Physical, verbal, or emotional abuse of elders by nursing home staff is unlawful and intolerable. Our nursing home abuse lawyers have the experience and knowledge to help you and your loved one hold the responsible party liable for their negligent or abusive actions. If you have noticed any of the above signs and symptoms or believe your elderly family member has been abused in any way, contact Stewart Bell, PLLC immediately at 877-959-6696. Don’t wait. We take allegations of nursing home and elder abuse seriously, and it is our mission to bring justice to the facilities that don’t treat elderly residents with the respect and care that they deserve. You and your loved one could be compensated if you have witnessed any evidence of elder abuse at the hands of a negligent nursing home facility. A nursing home abuse lawyer will guide you through the difficult process to help ensure the safety and well-being of your loved one. In addition to providing answers and advising you and your loved one on what legal action to take, our nursing home abuse lawyers can help you find a reputable facility that will properly care for your loved one. At Stewart Bell, PLLC, we put the health and happiness of our elderly citizens first. John Denver said it best, “Country roads take me home to the place where I belong, West Virginia.” But what happens after an accident happens on those beloved country roads? You call Stewart Bell, PLLC. We have over 30 years of experience defending Charleston’s injured citizens, and are here to help you through your time of pain and legal uncertainty. Our qualified and proactive team is prepared to review your case and tailor our approach to your particular needs. For instance, if you’ve been in an accident involving a truck, our skilled truck accident lawyers can lead you through the overwhelming process and obstacles associated with truck collisions. Injuries sustained in truck accidents tend to be particularly severe, therefore the medical costs and lost earnings are higher and not always covered by settlements. Stewart Bell’s experienced truck accident lawyers understand the specific issues victims face after an accident of this scale, and can offer their knowledge and resources to ensure your claim is accurately represented, giving you a fair shot at maximum compensation. If you’ve been in an accident due to someone else’s carelessness, Stewart Bell, PLLC might be able to help you gain compensation for your losses and the trauma you’ve experienced. Don’t wait to find out, call our Charleston office today at 877-959-6696. Stewart Bell, PLLC is collectively recognized as West Virginia’s largest nursing home and elder abuse litigation team. Our personal injury and nursing home abuse lawyers in Charleston have played a crucial role in securing the firm’s success, recovering millions in compensation for clients who have endured pain or watched a loved one suffer. Our attorneys consult with expert witnesses in the medical, investigative, financial, and manufacturing fields to support our clients’ cases. Not only will our highly-qualified staff put our resources, technology, and intelligent approach to work for you, but we understand the emotional nature of injury and abuse cases. Compassion for your specific situation and well-being is the top priority for our entire staff. That’s why we work quickly and diligently, while keeping you updated on the progress of your case from beginning to end. With Stewart Bell, PLLC, you can rest easy and focus on recovering, because your case will be in the hands of hard-working, experienced West Virginia trial lawyers that know how to present a strong case. Plus, we work on a contingent-fee basis, meaning we don’t get paid unless we achieve successful results for your claim. Only an experienced injury attorney can evaluate the facts of your case to determine whether you have the grounds to file a lawsuit. To find out if your claim is valid and receive professional legal counsel throughout the next steps of this difficult process, contact our main Charleston office at 877-959-6696 today for a free case review.